Living room, dining room, kitchen, cloakroom w.c.
Two double bedrooms, box room, spacious shower room w.c.
Close to the sea, this is a delightful, old, semi detached, two double bedroom village house within a short walk of the beach, harbour and village centre, within the highly regarded and sought after coastal village of Gorran Haven on the beautiful Gorran peninsular, with beaches and coastal walks continuing to The Roseland. Having been in the same family ownership for over half a century, the property comes to the market with immediate vacant possession and scope for some modernisation updating, allowing the purchasers to incorporating their own decorative and design ideas. Located literally within just a few minutes walk down to the sea, the property occupies an appealing setting fronting on to Foxhole Lane, with useful side workshop store and immediate paved patio, elevated patio, lawn and shrub gardens to rear from where the property commands delightful elevated rural views with the sea in the distance. Accommodation provides living room, separate dining/family room, kitchen and cloakroom w.c. To ground floor. 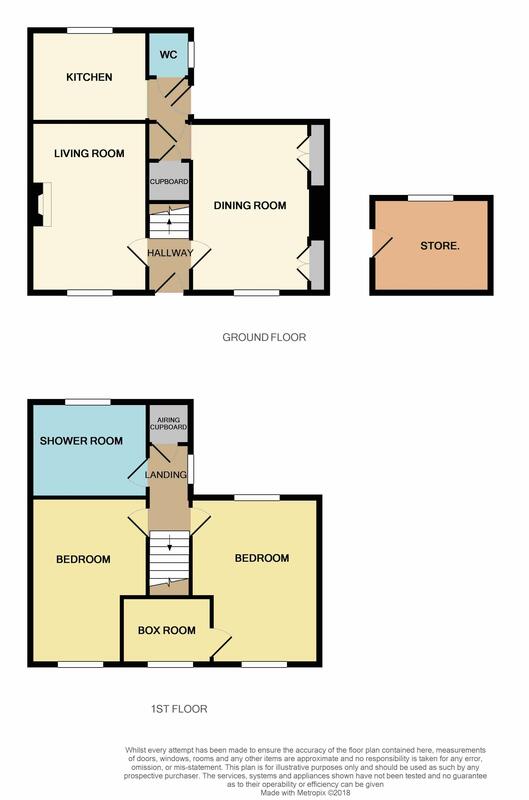 Two double bedrooms and further box room providing potential as dressing room/nursery or casual third bedroom, along with spacious 'wet room' style shower room w.c. To first floor. The accommodation is served by electric night storage background heating, complimented by UPVC framed double glazing. Gorran Haven is a delightful coastal harbour village on the Gorran peninsular which lies some six miles to the south of St Austell, noted for its natural beauty and unspoilt beaches, with many cliff top and rural walks continuing to The Roseland. This is a superb coastal environment for the young family with a range of coastal village shops, supported by neighbouring Gorran with its vibrant primary school. Combining this property's excellent setting, accommodation and potential, it is anticipated to appeal to a good number of people, being considered equally suited to the young family, retired/professional couple or those seeking a second home/investment, and early appointments to appraise are advised. Courtesy light, part glazed door to hallway. Central hallway, staircase to first floor. Doors off to living room and dining room which in turn leads to cloakroom w.c. And kitchen. Attractive room, tall window to front, brick finished fireplace and hearth, electric night storage heater, TV aerial lead. Again, well proportioned room with tall window to front. Old chimney breast with recesses to sides with display shelving and cupboard storage. Electric night storage heater. Recess with understairs storage cupboard. Door to rear porch with half glazed door opening to rear. Door to cloakroom w.c. Open doorway to kitchen. Low flush w.c., wash hand basin. Pattern glazed window to rear. Range of base and wall units providing cupboard and drawer storage, working surface over with part tiled walls adjacent, incorporating inset sink unit, cooker space with electric cooker panel, further appliance space. Extractor fan. Picture window to rear enjoying garden and elevated rural outlook. Good natural light via window to rear, recessed shelved airing cupboard housing hot water cylinder with immersion. Doors off to both main bedrooms, one leading to box room, large shower room w.c.
Narrowing to 8' 4'' (2.54m) Dual aspect room with window to rear enjoying elevated rural outlook. Window to front with views over the village. Electric night storage heater. Door to box room. Previously used as casual third bedroom. Ideal for use as dressing room or nursery. Window to front with outlook over village. Narrowing to 7' 8'' (2.34m) Window to front with outlook over the village. Electric night storage heater. Spacious wet room style shower room incorporating corner shower with fully tiled walls adjacent, curtain and screen divide. Pedestal wash basin, low flush w.c. Further half wall tiling. Electric night storage heater. Strip light/shaver socket. Pattern glazed window to rear. 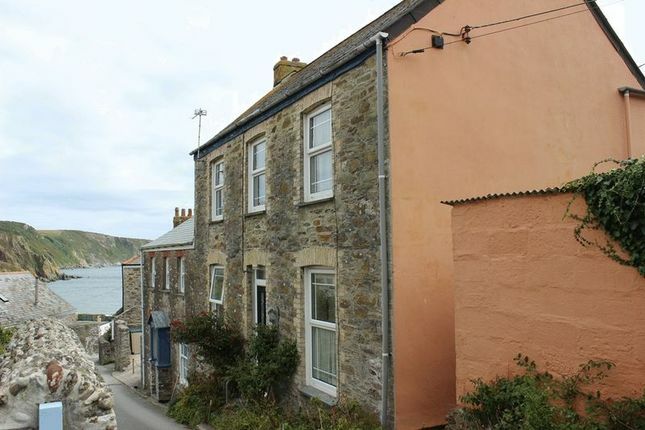 The property fronts on to Foxhole Lane, literally within just a few minutes walk down to the beach, harbour and village centre. Front rockery beds, pathway to side with useful workshop/store. Further to the side is a well enclosed paved patio garden with high raised bank borders, pathway around to rear with steps up to paved seating area giving on to rear lawn with well stocked shrub features continuing to side, timber fencing to boundaries. Delightful elevated rural views and coastal views are enjoyed from this rear garden aspect. Block built construction, window to rear. There is no parking with this property but immediately behind is the driveway approach to the Memorial Hall and viewers may be able to park there at their own risk for a short time whilst viewing. Property descriptions and related information displayed on this page, with the exclusion of Running Costs data, are marketing materials provided by Burrows Estate Agents, and do not constitute property particulars. Please contact Burrows Estate Agents for full details and further information. The Running Costs data displayed on this page are provided by PrimeLocation to give an indication of potential running costs based on various data sources. PrimeLocation does not warrant or accept any responsibility for the accuracy or completeness of the property descriptions, related information or Running Costs data provided here.